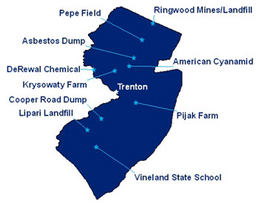 CRISIS is an independent environmental community group serving as a watchdog for Somerset County, N.J. residents regarding the remediation and clean-up of the highly contaminated American Cyanamid Superfund site. The complex site, with over 400 acres remaining, is located mainly in Bridgewater (several acres are in Bound Brook) adjacent to the Raritan River and near the Patriots' ballpark. A map of the site may be found on our website or at the link www.AmCyRestoration.com which has more information about the site. CRISIS has received funding to cover a Technical Adviser (TA) under a US-EPA TAG grant for over two decades starting in 1992/93. Our mission is to serve as a community watchdog and information source regarding the progress on remediation planning and implementation by the site's owner (currently Pfizer, Inc.), its consultants, the US-EPA and NJ-DEP. The site consists of multiple contaminated impoundment lagoons, many of which contain medium or high concentrations of highly toxic materials including benzene, other volatile or semi-volatile organic compounds (VOC and SVOC) and some dangerous metals. Contaminated groundwater flows across the site, a portion of which has been untreated when it feeds into the Raritan River. EPA has stated that it now views the entire site as a floodplain as demonstrated during Hurricane Irene in August/September 2011. Susceptibility to massive flooding complicates the remediation techniques that are acceptable to the community. CRISIS looks to support both effective and practical remediation and clean-up solutions (in this very difficult environment) covering large masses of impoundment materials, contaminated soils and contaminated groundwater. • Provide independent, objective technical critiques of remediation techniques and technology proposed for the site and implementation plans (as put forth by Pfizer and US-EPA, now the lead government agency). • Critique such plans as they may impact community safety (e.g., unsafe air emissions or local disruptions such as hauling soils into or out of the site). • Monitor and suggest environment testing (e.g., level of contaminants in the Raritan River near the site). • Promote alternative technical approaches to particular remediations as feasible (inputs mainly from our Technical Adviser). We suggested a dedicated groundwater pretreatment plant for several years, and this is now being implemented by Pfizer. • Monitor emergency measures taken by EPA and Pfizer to meet threats such as seepage of benzene into the Raritan River. In our role as information source (to our members and the wider community), we gather information at Pfizer meetings, study all reports and letters from Pfizer, EPA and DEP and disseminate important information by several means: e-mail updates, CRISIS newsletter, press releases and our new website www.crisistoxicwatch.org). We actively participate in all EPA and DEP sponsored public meetings about this site and are available to report to local government entities in Somerset County. CRISIS is a not-for-profit group. We received a $50,000 TAG grant renewal from US-EPA in early 2013 to run for an almost 3 year period. The TAG was extended for a year in August 2016 with no addition to the funding provided by the 2013 TAG. CRISIS was started in the late 1980's to fight (successfully) against the building of several waste incinerators near or on the American Cyanamid site as a threat to community health. Award: In May 2016, CRISIS was awarded a US/EPA Region 2 Environmental Champion Award for our work over 23 years on the American Cyanamid site. Ross Stander, Executive Chairman: semiconductor industry physicist at RCA and Materials Research Corp. (MRC); and technology management consulting firm founder/owner since 1986. Member of Bridgewater Cyanamid Oversight Committee (BCOC). Technical Adviser: Dr. Ira Whitman, P.E. -- Ph.D. Environmental Engineering, Johns Hopkins University. Founder and principal of Whitman Co., an environmental consulting firm located in New Jersey since 1985; Director of State of Ohio EPA 1972-1975. The Board of Directors and Executive Director have served throughout the entire period of the prior TAG grant. The TAG grant provided funds for hiring of our Technical Adviser (TA). Membership dues of $15 per year were suspended some years ago when remediation planning at the site was at a very low public level of awareness. Membership dues of $15 per year continue to be suspended, although we welcome contributions. Address: Please contact us via email and we will be happy to provide you with the appropriate mailing address.